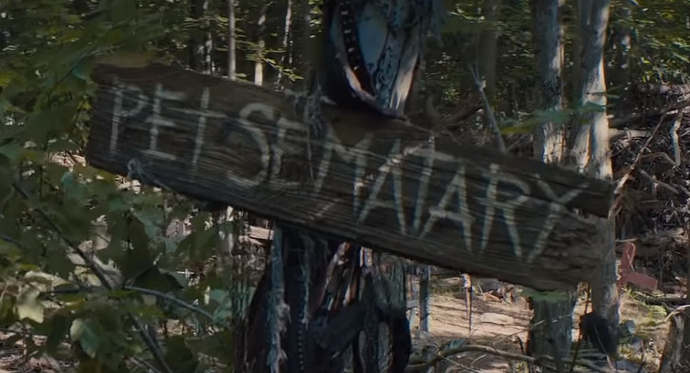 Now it’s been decades since I read the book, and I do recall it scared the holy hell out of me, but is this trailer a bit of clever misdirection or are they deviating from the source material a bit? I don’t remember anything about kids in masks from the book. I don’t remember that being in the book, either. Only thing I remember about the film version is that Ramones song. Is that Lithgow? Looks like Herschel from Walking Dead. All I remember from the first film is the fucked up cat and Herman Munster. I’m amused at the misspelling of “Sematary” in the thread title. Very good book, very memorable. The first movie made from it was just embarrassingly awful though. I hope this one is good. You and @telefrog know that’s not a typo, right? The idea is that little kids created that sign, and spelled it wrong. I originally misspelled the misspelling in the thread title. Starry Eyes was a pretty nasty piece of work. Here’s hoping they bring the same unpleasantness to this one. I read the book and it was scary. Never saw the movie because I heard it was terrible. It’s a shame most of King’s books have been made into bad movies. Not wrong, but the film featured a pretty sweet theme song by The Ramones (I believe King was a huge fan of the band). The trailer for the 2019 version looks decent. I found the truck speeding past the family’s beautiful new home to be surprisingly effective. PSA - There’s a new trailer for this with a gigantic spoiler in it. Like, humongous. It’s something that would’ve been awesome to watch in the theater for people that had seen the original movie or read the book. I’m not a spoiler-phobe, but even I’m pretty disappointed that the trailer spoiled this. I guess the answer to my question may be also be a spoiler, but is that a typo? Do you mean it would’ve been awesome for people that hadn’t seen/read the original, or is it something that’s going to take people by surprise if they’re familiar with the other versions? Edit: never mind, got my answer elsewhere. I didn’t get specifics, but saw a headline saying the movie makes a “major change” from the originals. Do you mean it would’ve been awesome for people that hadn’t seen/read the original, or is it something that’s going to take people by surprise if they’re familiar with the other versions? It’s definitely a thing that would’ve had more impact on people that had seen the old movie or read the book. I saw this last night and I thought it worked decently as a horror movie but it’s probably fairly forgettable to most people. Even if I haven’t read the book, I’m glad I didn’t see the trailer because it would almost totally spoil the movie for me. I wish they would have done more with the animal masks because they were really unnerving. John Lithgow really held the movie together but the other actors won me over (so many tears on cue) by the end. I might need to track down the book to find out how much the story differs because presumeably it’s a totally different ending. I’ve only read The Stand (premise was great but way too drawn out) and Salem’s Lot (great characters and plot) and it seems more similar to Salem’s Lot so I might enjoy it. If I had to compare the movie to other adaptations it is probably on par with The Mist movie but nowhere near Carrie ('76) or The Shining. Haven’t seen the movie but from the trailer I suspect the movie is quite a bit different from the book. Did he live up to Fred Gwynne’s turn in the 1989 adaptation? His attempt at a Maine accent wasn’t great, but he delivered the best kind of over-the-top performance for me.